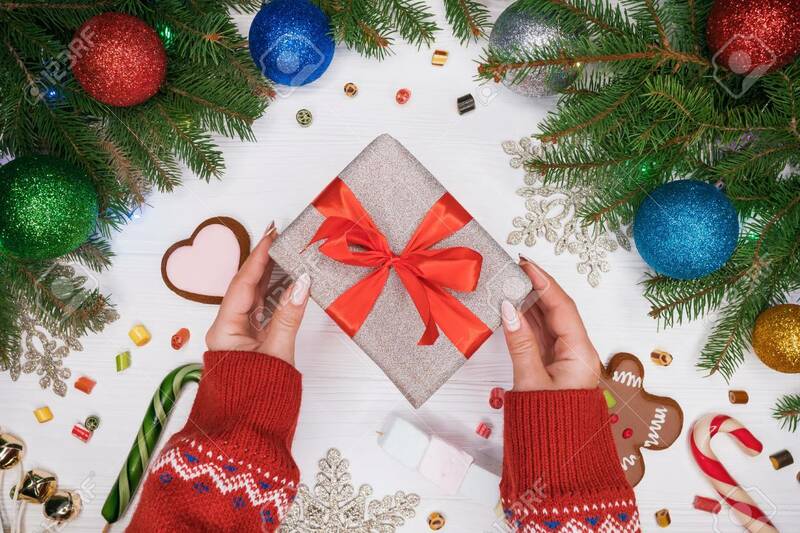 Hands In Warm Sweater Holding Gift In Silver Paper With Red Bow. Wooden White Table With Christmas Decorations - Spruce Branches With Christmas Balls, Gingerbread, Lollipops. Foto Royalty Free, Gravuras, Imagens E Banco De Fotografias. Image 113085725. Banco de Imagens - Hands in warm sweater holding gift in silver paper with red bow. Wooden white table with Christmas decorations - spruce branches with christmas balls, gingerbread, lollipops. Hands in warm sweater holding gift in silver paper with red bow. Wooden white table with Christmas decorations - spruce branches with christmas balls, gingerbread, lollipops.